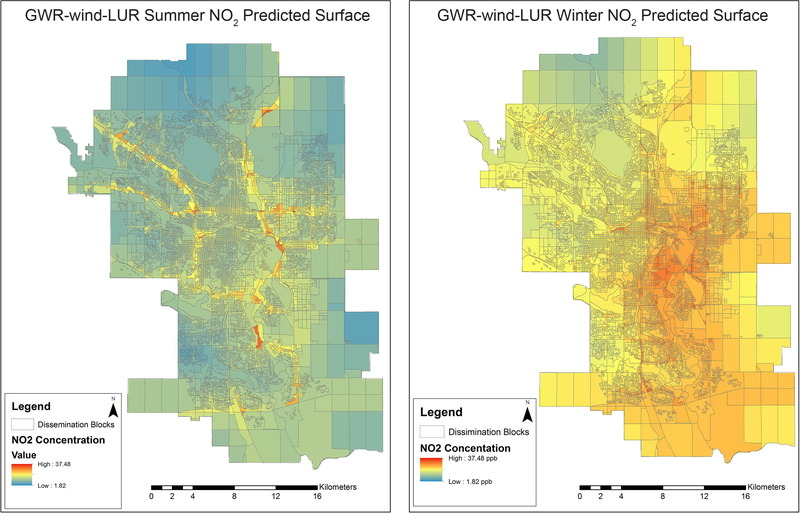 A team from the University of Calgary conducted a study that takes a first look at the relationship between walk-ability and air pollution, especially near schools. This builds on recent work, which shows that air pollution varies substantially over our city. Don’t forget that our city is BIG: it extends over more than 800 square kilometers; its elevation varies by as much as 300 meters between the highest and the lowest residential neighborhood; we are exposed to strong winds that can change direction in the span of minutes. Where does our pollution come from? In Calgary, mostly from our industries and from transportation; that is, from us driving our cars, on major roads (Crowchild, Deerfoot, etc.,), as well as throughout our residential neighborhoods. From those sources, where does the pollution go to? Industries are mostly located in the north-east; that is, downwind from westerlies. Major roads are mostly located in river valleys (many are called trails). Vehicle exhaust may ‘stay down’ or ‘go up’ depending on a lot of factors, such as temperature, pressure, humidity, and wind. Have a look at the maps they show the nitrogen dioxide (NO2) level, a noxious pollutant harmful to our health. You can see that NO2 levels in the summer are highest near major roads, while in the winter they are more diffuse. We think that is because, in addition to the differences in atmospheric patterns, in the winter we pollute more, because we need the heat, and perhaps we tend to drive more. Car engines work harder too. Coming to walk-ability. You can visit Walkscore and find out how walk-able your community is, as well as different parts of the city. You can also find out how bike-able and transit-able they are. And you can read how those scores are calculated: they primarily consider how many amenities you can find within a given distance, but they DO NOT consider how polluted your air is! In other words, there are some parts of the city where walk-ability is high and so is air pollution (relative to the rest of the city). So the question is, overall, does breathing polluted air offset the benefits of walking? The research asks this question particularly with respect to schools. The team built maps that tell this story. Have a look at the story map. The map tells us an interesting story. Researchers computed an experimental index, they called it ‘pseudo- AQHI’ because it is similar to the AQHI – air quality health index calculated by Environment Canada. That means it considers nitrogen dioxide (NO2), ozone (O3), and particulate matter (PM2.5). To make the message simple and clear, the map breaks up the air quality index into 3 categories: something like ‘low’, ‘medium’, and ‘high’, relative to pollution levels in Calgary (which are generally low to moderate, compared to other cities in Canada). The map also shows a walk-ability index in the neighborhood of each school. This index is also broken up into 3 simple categories: ‘low’, ‘medium’, and ‘high’. What is the moral of this story? There are two messages. Some schools, especially around the downtown core, have high walk-ability and high air pollution. Parents and teachers may want to be aware of this, although the study is not conclusive with respect to health risks. Pollution levels appear to be higher in the north-east in the summer and, somewhat surprisingly, in parts of the south in the winter. What shall we, as citizens, make of this information? Not panic. Overall, air pollution in Calgary is normally within low to moderate risk levels: lower than the threshold of harm. Be aware that air pollution is not the same everywhere in the city: some places are better, some worse. Be smart. Understand where air pollution is higher and choose carefully where we walk, jog, take our children to play. Tip: traffic-related pollution tends to be higher close to the road and declines fast as you move away from the road. If you can, don’t walk on the sidewalk of a busy road; rather, take a smaller road just a block away. And remember to do the same when you walk your kids to school. Walk on smaller roads, cross the street to stay far from those idling school buses and idling vehicles of parents that are less conscientious or knowledgeable than you!